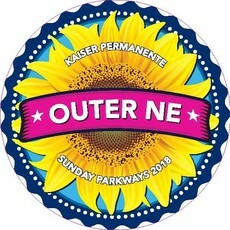 (Aug. 15, 2018) Portland Sunday Parkways presented by Kaiser Permanente launches its fourth event of the season on Aug. 19 with a return to Outer Northeast Portland. This 7-mile traffic-free, family-friendly route takes riders, runners, rollers and walkers on a tour of East Holladay, Thompson City and Knott City Parks and introduces the newly opened Gateway Discovery Park. Through this event, everyone is invited to the Gateway area to try out e-scooters, grab a bite to eat, try out Zumba and collect their fourth neighborhood decal from the popular Kaiser Permanente Sticker Hunt. In keeping with the Portland Bureau of Transportation and Sunday Parkways’ ongoing partnership with Portland Parks & Recreations’ Parks for New Portlanders, Sunday Parkways will co-host the second annual WALK with Refugees and Immigrants. This year the WALK falls on World Humanitarian Day, and participants include Mayor Ted Wheeler, Commissioner Amanda Fritz, Commissioner Chloe Eudaly and Ruth Williams-Brinkley, the president of Sunday Parkways’ presenting sponsor Kaiser Permanente Northwest. The celebratory one-mile permitted walk will gather community members and elected leaders at 11 a.m. at Gateway Discovery Park and will conclude at Knott City Park at approximately 12:15 p.m. During the walk, traffic between Gateway Discovery Park and Knott City Park will be one-way on the Sunday Parkways route, with thousands of people walking. Participants who will not participate in the walk are encouraged to travel counter clockwise moving from Gateway Discovery Park towards East Holladay Park between 11:30 a.m. – 12:30 p.m. The WALK is open to the public and encourages all neighbors, faith-based organizations, local businesses, neighborhood associations, and nonprofits to join with its purpose to inspire a more compassionate, generous and welcoming Portland. In addition to introducing a new park, electric scooters will make their debut at this month’s Sunday Parkways. During the event, e-scooter riders will be expected to follow state and city laws at Sunday Parkways - including wearing a helmet while operating the e-scooter and not riding on sidewalks or in City parks. Bird and Lime will set up next to Gateway Discovery Park and offer free helmets and demos of the new e-scooters. This weekend’s Sunday Parkways will highlight several of PBOT’s upcoming infrastructure projects aimed at improving safety, access to transit, and bicycle connectivity. These projects, a combined investment of $21 million over the next three years, are expected to improve access to jobs, transit, education and economic opportunity. These projects include: Halsey-Weidler Streetscape Project, Holladay-Oregon-Pacific (HOP) Neighborhood Greenway, 100s Neighborhood Greenway, 130s Neighborhood Greenway, and Outer Halsey Safety Improvements. Sunday Parkways is one of many engagement strategies PBOT is employing in this historically underinvested area to provide greater multimodal access for neighbors. Learn more about the work on PBOT’s Gateway to Opportunity website. For maps and more information, visit PortlandSundayParkways.org or call 503-823-7599. Follow us on Facebook at PortlandSundayParkways and on Twitter @Sunday Parkways. Portland Sunday Parkways, presented by Kaiser Permanente, is a series of free community events opening the city's largest public space—its streets—for people to walk, bike, roll and discover active transportation. The events are beloved by Portlanders of all ages. Total attendance to date has been 889,035 over 44 Sunday Parkways events. Residents and visitors say they come to enjoy the traffic-free streets connecting parks and schools filled with activities, music and vendors. It’s safe, family-friendly and a chance to meet neighbors.